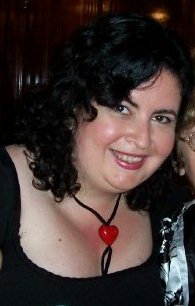 Zee Monodee: Writing Wednesday: Welcome to Natalie G. Owens! Writing Wednesday: Welcome to Natalie G. Owens! It's my absolute pleasure today to be welcoming the woman I consider my soul sister, the other writer-half of me, and a delightful, wonderful person - Natalie G. Owens! I met Natalie a few years ago, but within a few weeks of meeting, we felt like we'd known each other forever. Our friendship and the ties that bind us just kept on growing deeper and stronger, and today, I can say without any doubt that she is my guardrail - the writer-side person who pushes me to be better, stronger, to aim higher in my work, in my author dreams. And I think that's not hard for her to do, because she's intrinsically a strong and competent writer too, one with a truly unique, lyrical voice that sings off the pages. Natalie has a way with words that, once you read her, makes you go, Damn I didn't know people could string words like that, so beautifully! Please give her a warm welcome! I cede her the floor now. Tell us a bit about you, and something we don't know/wouldn't expect about you. I think a lot of people fall into that 'trap' - I did too. But some find a way out of a doldrum-type existence, and I'm glad you did! What’s your favorite moment of the day, and why? Usually early morning, before everyone wakes up. I tend to get work done at that time. However, I have also come to love evenings, when I spend time with my son before he goes to sleep and wind down for the day, perhaps with a bit of reading. You're a color – which one are you and why? Because it makes me happy. Because I feel I have something to say… and because it is cathartic for me. Writing was my therapist in the beginning, and it got me through some tough times. Today, I want to share my work with others, and hope they want to read it :). As writers, we are bombarded with ideas every minute of every day. How do you sort through these ideas, to stick to the 'viable' ones? Sometimes I hit a wall with my ideas…but what works for me is to sometimes let it go. Not to force things. Then ideas come to me when I least expect them to. As far as going with the right choice – I think it’s all about instinct. A writer knows what’s going to work in the story and what won’t. It’s all about being honest to yourself and to the story. How do you develop an idea into a book? Lol, I’m not sure I can offer useful advice her. But, I must say that brainstorming with my trusted critique partner always brings up amazing concepts and ideas. At times I speak to my husband, and he may come up with something genial. Or, perhaps I may read an article and it sparks into a speck of an idea in my head, that eventually snowballs into something entirely different. It’s all about happenstance – and being ready to receive the gift when it comes to you. Now, as far as developing this idea into a book, I like first to have a very general, sketchy idea of a plot. Following this, I figure out who my main characters are going to be. Then, I scout for pictures on the Internet so I can see what my characters look like. At the same time, I develop their back story, which gives me insight into their GMC (goal-motivation-conflict) and helps me determine how they’re going to behave and react in particular situations. From this point on, I start refining the plot/sub-plots and then, do a chapter by chapter breakdown. Writing a rough synopsis is a good springboard. In case of fantasy, I will need to do extra work related to world-building (e.g., the Valthreans in my work in progress, An Eternity of Roses), and identifying the culture/norms of a particular society. These, of course, will have a direct bearing on the story. If there's one book you wish you had written, which one is it and why that book in particular? Only one? I’d say there are quite a few – Jane Eyre, The Historian, The Venice Conspiracy, The Children of Men. There are more. First, I love a good romance. I also love books with a gothic feel to them, as well as stories with compelling characters and an underlying philosophical bent. Which is easier for you – narrative, or dialogue? I’d say narrative – but I’m learning to be more economical with my language, and I know that one word can often be more effective than five. This helps me with my dialogue. To write better dialogue, the process is very in-depth with me. I always get deep inside my characters, literally lose myself in them – this takes away a lot of energy :). But, this is what I always strive for… I want my characters to be/feel natural. Awww, don't take too much away from that lovely voice! POV of predilection? Which POV mixes with you like oil and water? I write in third person POV – sometimes, very rarely, third person omniscient (when I first started writing I did this more often). I would also love to write a book in first person, but so far I haven’t attempted it – not sure if it mixes with me like oil and water as I haven’t really tried it yet. Romance! Because no matter how much I drag my characters through misery and trials, I can’t let go of that happy ending. And, I really want to make readers smile. I want to give them a few moments of escape. How do you get into your characters' heads and shoes? By thinking of them. Sleeping with them. Waking up with them. Daydreaming about them to the point that my family thinks I’m a bit more than weird. I’ll be extremely distracted, and if you’re talking to me while I’m with my characters, chances are I have no clue what you were saying. Drafts, edits, polishing – love or loathe? Can you please explain? Edits drain me – but if they are going to make the story better, then I’m fine with them. Polishing though, it’s a necessary evil that I don’t like much :). That said, I’m a bit of a perfectionist and will go through a story two dozen times if I have to. What unique factor do you think you bring to the book/story market? It’s probably my voice that has a literary vibe to it, and that I adapted to genre fiction. I also love to use exotic locations in my stories, as well as add a touch of the gothic. Best advice you've received, and that you'd want others to know? If you want to be a better writer, just keep writing and slog through the not so glamorous bits of this career. If you really want this, never give up – no matter what they tell you. No matter the rejections. Another thing – when you’re starting out, don’t be afraid of constructive criticism or take the stance that you know everything. Use the feedback to improve your skills, and appreciate it for what it helps you become—a more confident writer. Then always, always thank the person giving it, whether you agree with them or otherwise. In short, don’t burn bridges, and don’t stop learning. 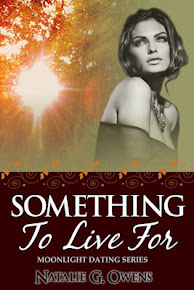 My latest release is a short story, called Something to Live for – the first book in my Moonlight Dating Series. It’s a story about two people who find uncommon ground in the most unlikely of situations. It’s also explores the element of healing and overcoming trauma through physical intimacy. It’s short, emotional, sweet and hot, and ultimately, it’s a ‘feel good’ type of story :). Melita Saari-Quinn is living the consequences of a traumatizing psychic event that turned her adolescence upside down. Now, disillusioned with her job as a psychotherapist and desiring a change from her lackluster existence, she hopes that something out of her ordinary sphere of existence - something totally uninhibited and spontaneous - will renew her zest for life. Let's say your book is a movie – which one does it most closely resemble? Not sure it’s long enough to be a movie… perhaps it could be an episode of The Twilight Zone with a romantic bent. What real-life actors are playing the roles? Now this movie needs a soundtrack – what songs/tracks best fit your book? I think that “My Immortal” by Evanescence describes really well Alex’s state of mind in this story. Your characters end up in a world where everyone's a fashionista – how do they dress and what are they wearing? I think that Alex would feel comfortable in just plain jeans and a t-shirt. Melita is very delicate and feminine so she’d love to wear light sundresses and sheath dresses. Do make it a point to check Natalie's work, peeps! I for one, cannot wait for her Valthrean series to come out - An Eternity of Roses is on my watchlist, in the very top spots! Great interview questions, Zee. Really, good. Natalie, very interesting answers. I feel I know you so much more now. Didn't actually know you were born in Malta. How extoic. Your stories are beautifully written. I loved A Kind of Judgement and Something to Live For, both beautifully written. Love your book cover and the premise...though my tbr list is towering and leaning a bit to the right, I'm tossing your book on the pile. Sounds like a great read! It's my pleasure, Nat, to finally have you visit!! Love ya, sis!! And Christine, you will soooo not be disappointed by Natalie's books. She takes my breath away every single time I read or re-read her stuff! What a wonderful interview. The warmth between you shone all the way to central Pennsylvania. :) Congrats on your new release, Natalie! It sounds like a very cool read. Just dropping by to say hi pretty ladies. Great interview. Nat get to feeling better. LMs orders. I loved the interesting interview questions, Zee. Nat gave some great answers. I really liked your blurb and excerpt. Hey Gary, Sandy...thanks for stopping by! love you guys. xoxo.